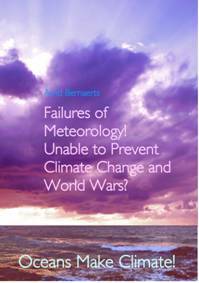 New book title (about October 2012): Failures of Meteorology! Unable to Prevent Climate Change and World Wars? Oceans Make Climate! Talking about the weather was not without risk. B. A three-year cold package. - Providing evidence? 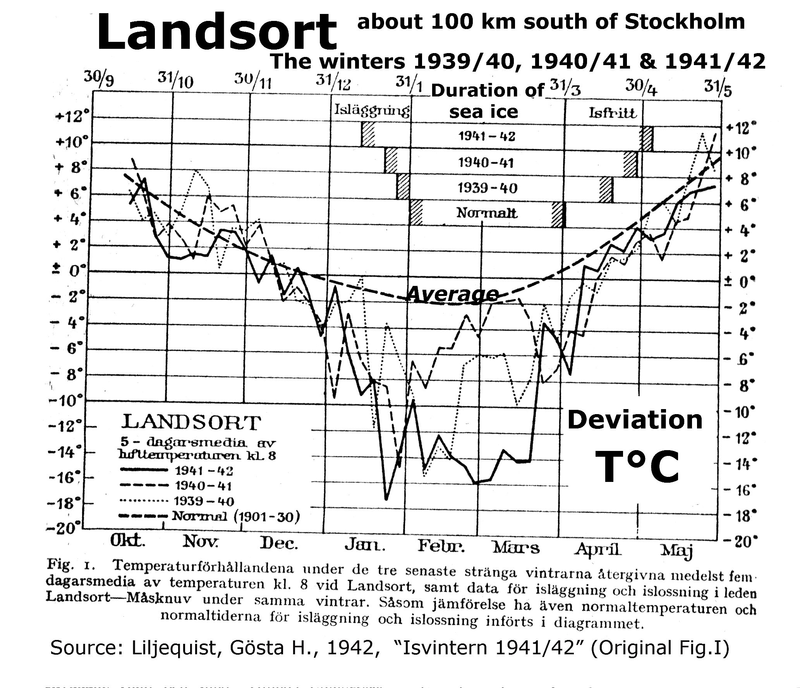 Liljequist (1943) identified this group of winters as the coldest ever observed in central Sweden , and presumably for the eastern Baltic as well. Which further observation does atmospheric science need to become active? Over the last 100 years every weather expert familiar with Europe would have told you that three cold winters in a row are highly unlikely. The Russian campaign of the German Army in winter 1941/42 was severely punished by General Frost. It was the fault of the forecasters, because they had been absolutely convinced that after the two cold winters 1939/40 and 1940/41 a third cold winter was unlikely if not impossible. But they were completely wrong. The 3rd WWII winter topped the first two war winters at a number of locations. 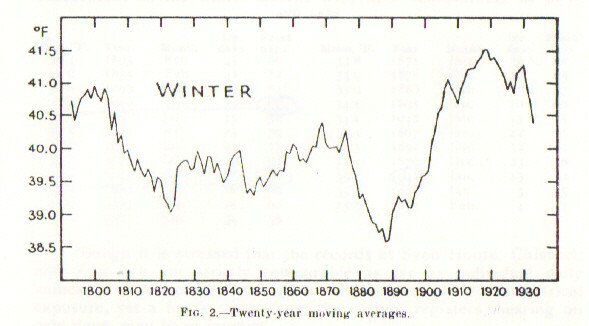 The first three war winters did not only very suddenly end a long period of an increasing trend of milder winters since the middle of the 19th century, but even exceed conditions of the Little Ice Age, by coming up with three winters in succession that matched the lowest winter condition during the Little Ice Age (LIA). If there are strong indications that the war in question came along with the lowest temperature over a period of 300 years from about 1550 to 1850, it seems time to ask some serious questions. 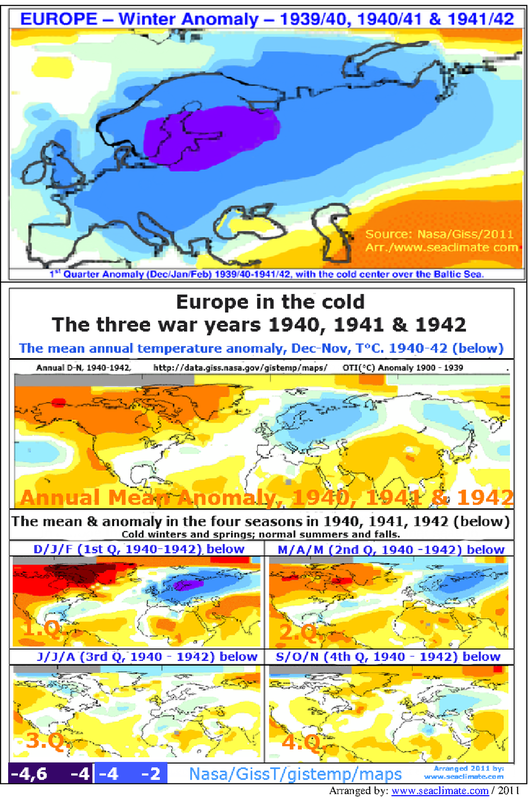 It is worth noting that only Europe experienced the three arctic winters during 1939/40, 1940/41 and 1941/42. North America and Asia did not go through the same experience. The eruption of the volcano Krakatoa, in Indonesia, on August 27 1883, that spread dust clouds around the globe and blocked solar radiation by up to 20% for three years (Wexler, 1951), had no significant effect on weather and climate. At least, no extraordinary weather conditions were reported. Unprecedented was the increased warming of the Northern Hemisphere, which started in winter of 1918/19 in the region where the North Atlantic and the Arctic Ocean meet (see: Fig. A3-1; Chapter I). 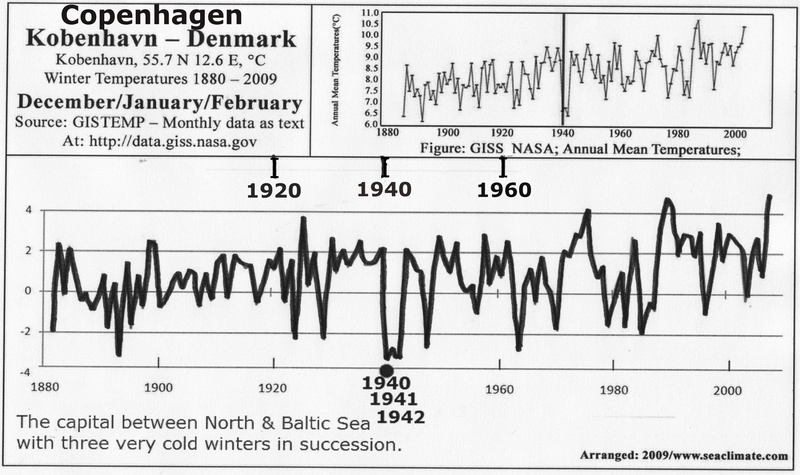 Temperatures of the Northern Hemisphere rose steeply and reached their peak around 1938/39 (Fig. A3-6 and A3-9, p.18 & 22). It should be noted that the previous warming had already come to a stop in the USA around 1933, while the European record moved higher and higher until the beginning of WWII. Actually, northern Europe was more affected, and the North Cape more than the south of Scandinavia (See TM14, p. 191, second row). 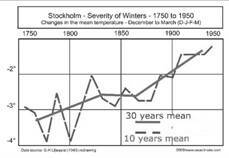 In Scandinavia , 1867 was the last very cold year. It had a polar character, with a mean of –2,7°C, in contrast to that of 4,3°C, recorded in 1938 (Groissmayr, 1948). This primarily had something to do with the warming recorded at high latitudes since 1919. 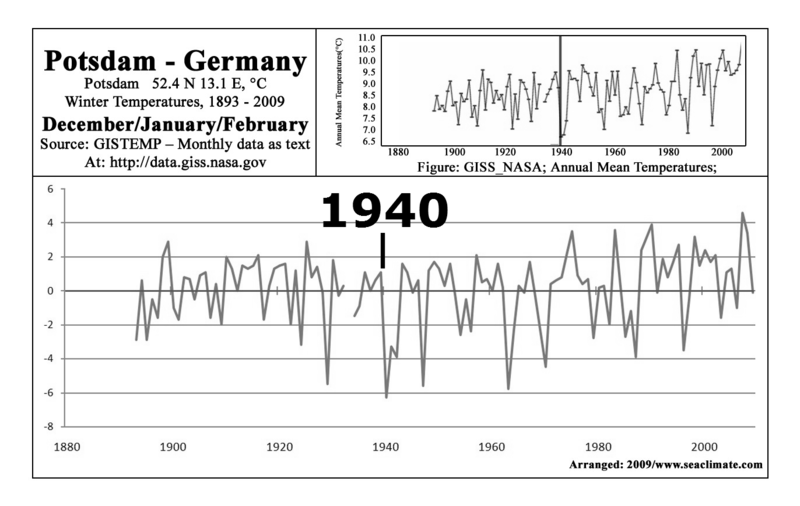 Whether this has been the only reason for the difference in temperature trends between the USA and Europe since 1933, is not to be answered here. Whoever is interested in this aspect, should consider that ship’s traffic increased steadily in the North Sea and Baltic during 1919 and 1939. But, whatever the cause, it is certain that for 20 years (until the winter of 1939/40), it had been getting warmer and warmer in Europe . 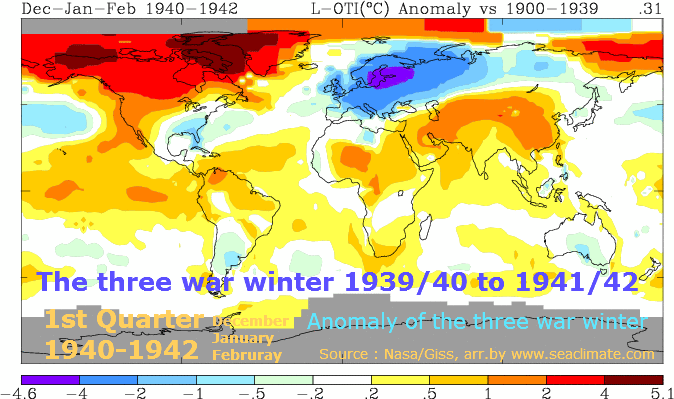 The global situation is well demonstrated by the Temperature Map 1 (TM1, page 5), which shows the winter temperature anomalies (DJF) during the winters of 1935-1939. North America was colder, while Europe was warmer in comparison to the mean temperatures from 1900-1939. 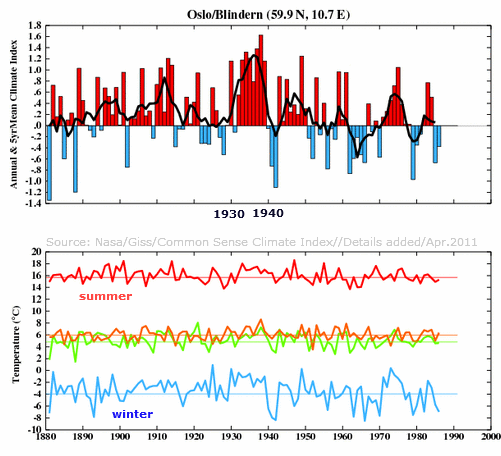 The rising trend stopped abruptly in the winter of 1939/40. From one day to another, the scenario changed dramatically and with it, so did winter weather. There was a change from warm to extreme cold. And this did not happen only once or twice, but for three winters in a row. 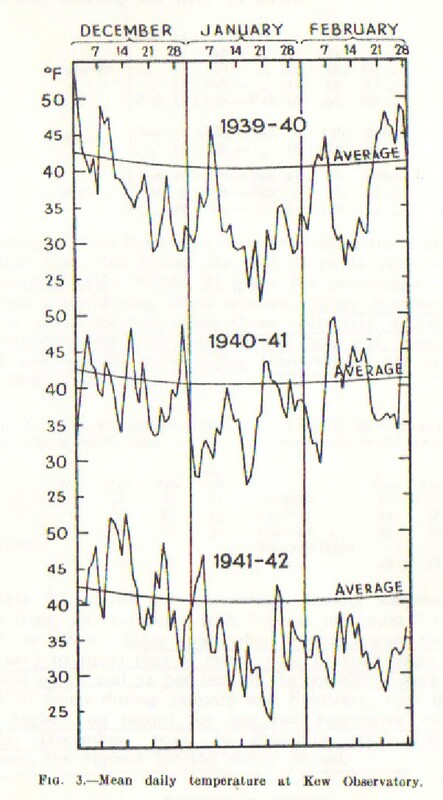 The contrast is impressively illustrated, if one compares the winter season (DJF) of 1938/39 (TM1; p.5) with the corresponding winter period 1939/40 (ditto), or for the first three war years - 1939/40 to 1941/42- (TM3, p. 25). That is quite a contrast. 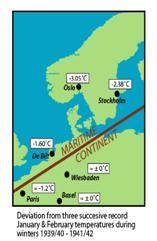 The scenario in Europe is shown for the annual conditions and for all seasons. Interesting details become clearly visible. The Baltic region was most severely affected by General Frost. Another interesting aspect is that in Great Britain there were colder conditions than in some parts of the North Sea (TM1 and TM3). so different from the previous ones, that one could get the impression that the three war winters played in another league. Few time witnesses realised that exceptional conditions occurred but could not see the force that stood behind the event: The naval war from the Atlantic to the Baltic made the winter weather colder. winters of 1940, 1941 and 1942. To highlight the theory he explained: "To produce clear scientific results that show the extraordinary strength of winters, I have calculated a long data series in groups of three years, between 1853, and 1942". 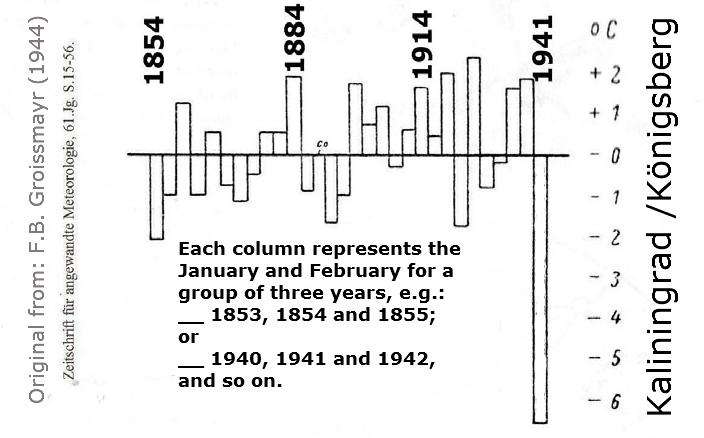 He did so for Dresden , Uppsla and Zürich and for Königsberg ( Kaliningrad ) in a figure (right), concerning the months of January and February in groups of three subsequent years, for example the mean of Jan/Feb in the years 1853, 1854, 1856, or 1940, 1941, 1942. Scientifically speaking, Groissmayr's demonstration is quite doubtful, but the result is quite impressive. For over 90 years, the lowest 3-years mean temperatures were never lower than –2°C. In contrast to that, during the winters of 1940-1942 temperatures of minus 7°C were recorded. Has this ever happened in another mid-latitude level? A figure with data for D/J/F at Kaliningrad is attached below (p. 29). bb. Two Norwegians were so close, but…. 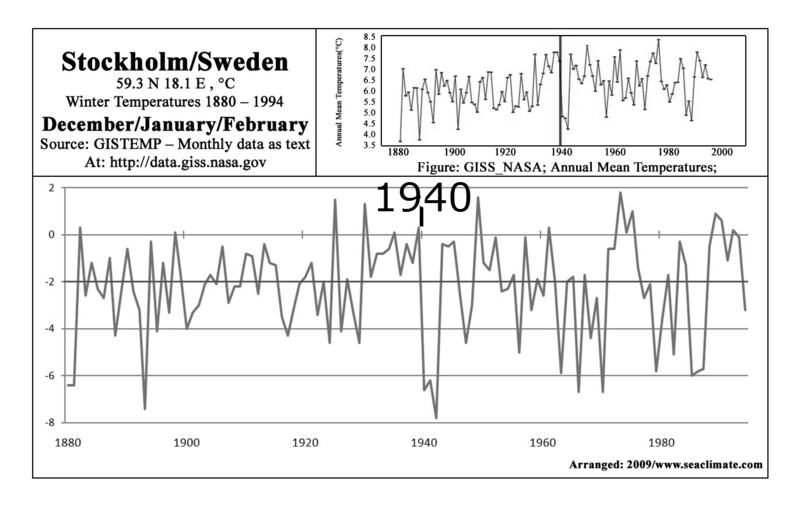 In the 1950s, they published their comprehensive analysis of climate in Norway . They emphasized the all time cold record temperatures at many stations in January 1941. They had been contemporary witnesses of the occupation of Norway by the Germans, only a few months before the coldest winter in Norway occurred. They had also been time witnesses of the three war winters during 1940-1942 that suddenly replaced a considerable rise of the winter temperature in the 1930s. Hesselberg and Birkeland (1944-1950) took interest in the extraordinary situation, but were completely unable to link it to the war. It never crossed their mind that all could be related to the naval war, and that the record winter of 1940/41 in Norway could have had a lot to do with belligerent fleets that had been operating in the Norwegian coastal waters and fjords for more than several months. 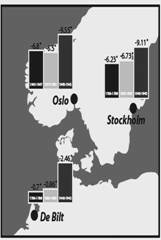 The authors analyze a number of stations from all over Norway . 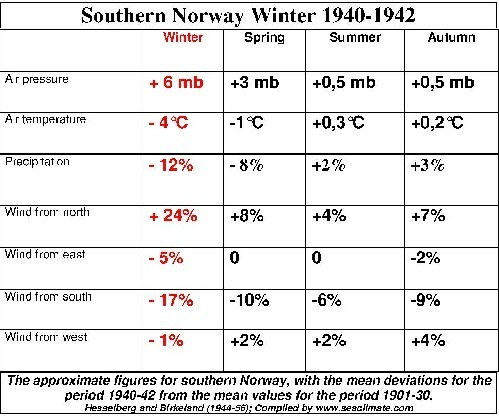 Figure B-5 shows only the approximate figures for southern Norway , the mean deviations for the period of 1940-42 being presented in contrast to mean values for the period 1901-30. · __Could it have been the sun? No, not during the winter season. · __Why did the air pressure increase? Was it because the North Sea and the Baltic were colder than during previous years, due to the naval war? · __Why was there a wind shift by + 24% towards the north? Could naval activities have generated more evaporation in the Baltic and in sea around Great Britain , thus resulting in an increase of air inflow from the north via Scandinavia ? After all, these are simple questions that any scientist should be able to analyze. But in order to be analyzed, these questions need to be asked. Hesselberg et al. did not do this, nor did several generations of investigators that followed them. 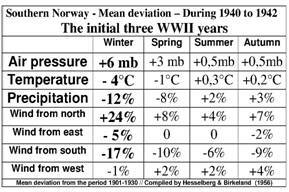 The very interesting aspect regarding the winter of 1940/41 in Norway is discussed in the section that deals with this winter (Chapter D). As I have already indicated in a previous section, a special place in my research is reserved for Gösta H. Liljequist. His Stockholm paper (1943) came to my attention long ago and was presumably one of the reasons that made me consider a correlation between naval war and the three extreme winters of 1940-1942. His findings, already published in 1943, should have spurred generations of scientists into action and should have set them to work in order to find reasonable explanations. But nothing has happened so far. Nevertheless, Liljequist's findings could still represent a starting point today. Although some of Liljequist’s considerations have already been mentioned above (A2b), his main findings shall be summarized here again, together with some figures. He explains that very cold winters generally occur in Sweden when the atmospheric circulation is weakly developed. However, there are cases in which they are intensified due to intrusions of cold air from the Arctic . The chances of having three consecutive cold winters are low. 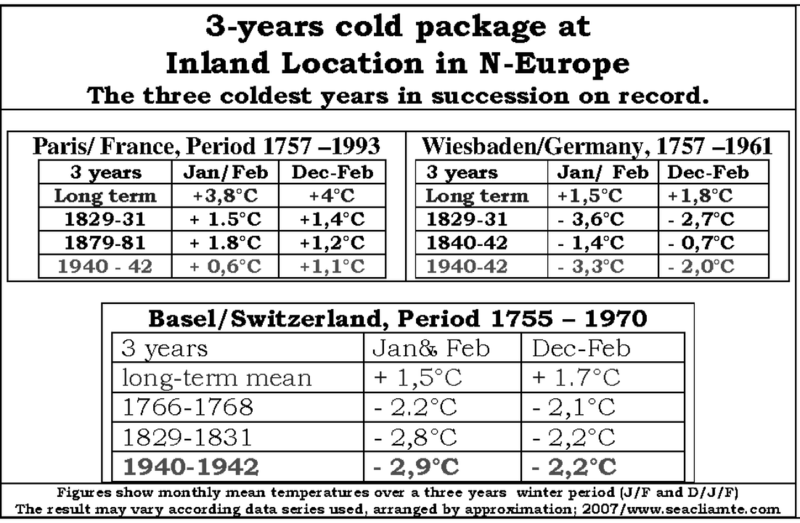 During 1757-1942, only three such cases occurred, when the mean temperature of December – March was lower than minus 5° C. To make the situation more transparent, I will explain it by using the two Figures B-6 and B-7. winters is shown in the image. 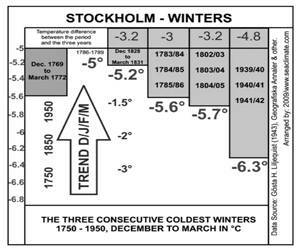 In the first 80 years (1750 to 1831) there were five winters that deviated from the mean by –5°C or more. The maximum of –5.7°C was reached by the group 1802/03 to 1804/05. It took 125 years to break the record with the three war winters (1939/40 to 1941/42). What is even more astonishing is the margin of 0.6°C by which the war winters prevailed over the previous record, while the difference between the second place and the third place is only 0.1°C. The stunning margin between the war winters and rank two from 1802/04 is – in practical terms – about one degree higher. 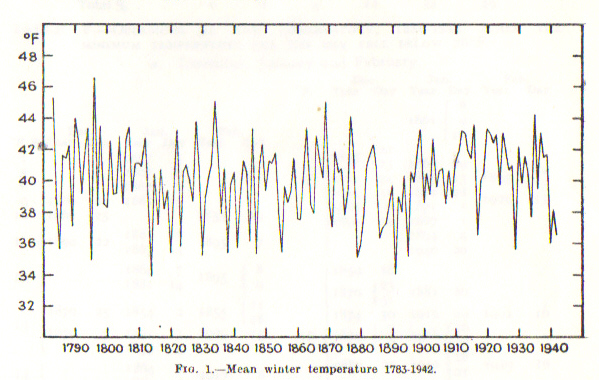 The fact is that, since 1750 winters had been getting warmer with 1° to 2°C, as indicated in Figure B-7. __Since the beginning of temperature observations from about 1760 up to the decade 1931-1940 mean temperatures of the winter have increased by about 2° C. This tendency is especially marked from the middle of the 19th century. The number of severe winters has decreased in recent years, while mild winters have remained rather constant in number. __The remarkable change in the winter climate came to an abrupt end in 1940, with three severe winters 1940, 1941 and 1942. It is noticeable that one of the very mildest series of three winters, viz. 1938-1939 preceded the most severe ones, 1940-1942. He did his job well. But, what is hard to accept is that he never considered to link the ‘remarkable change’ to war conditions or to provide another reasonable explanation. Kaliningrad and Stockholm mean something? Presumably a lot! It is sufficient to see the difference in naval activities in the Baltic, in late 1939.The fighting from the eastern Baltic, in June 1941, ended because winter-use of the sea was prevented due to ice, and the virtually destroyed Soviet Baltic Fleet. 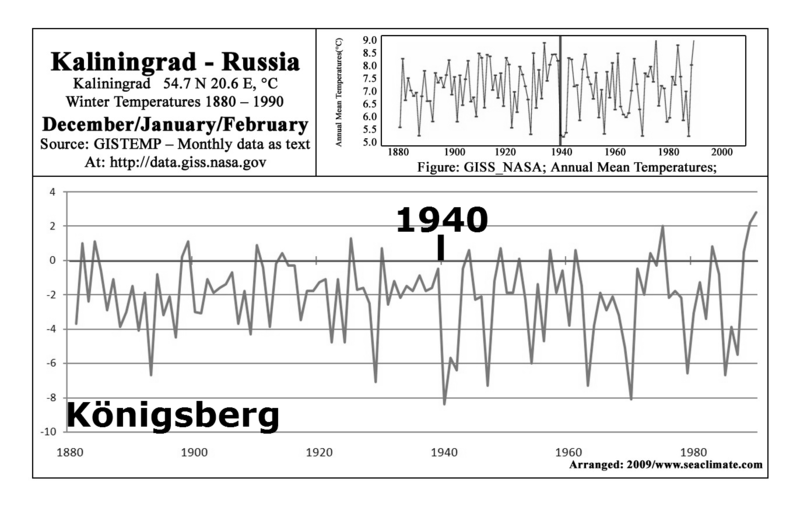 In Kaliningrad , the sharpest temperature drop was in the winter of 1939/40 (Fig. B-10). 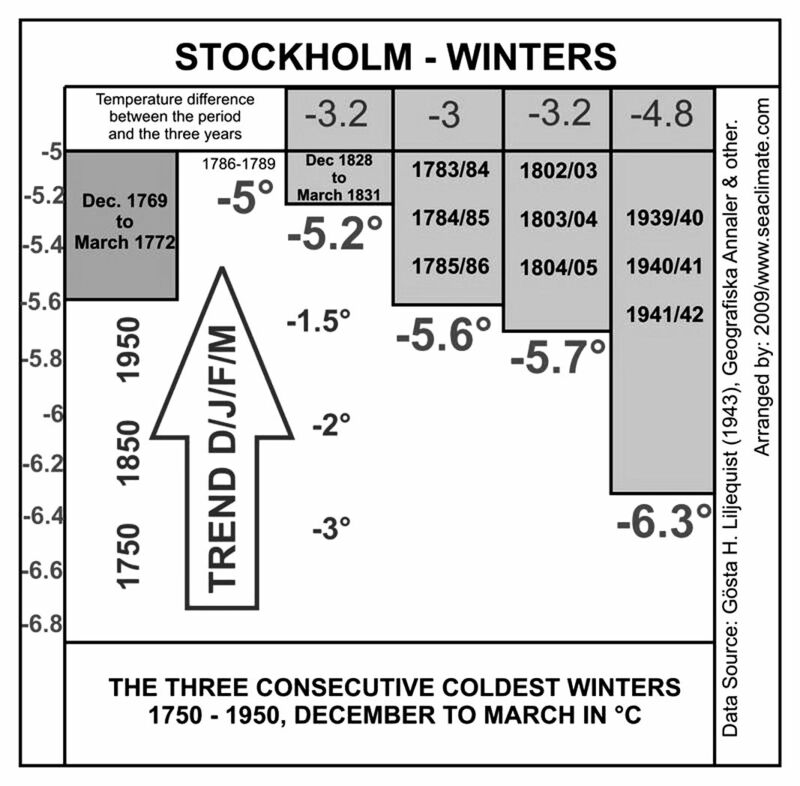 In contrast, in Stockholm the most pronounced drop was recorded in the third war winter, i.e. the winter of 1941/42 (Fig. B-9). The distance between the two cities (calculated across the Baltic) is only 500 km. The temperature deviation between the 1st and 3rd war winter is enormous, with more than 2° to 3°C over a period of three winter months. One of the explanations refers to major naval war areas prior to the lowest temperature record. In autumn of 1939, the sea area in the south-east of the Baltic, the Bight of Gdansk, was major battle ground. The sea here is 100 metres deep which makes it one of the deepest places south of the Åland Archipelago. Two years later, starting from June 22nd 1941 , the sea area from Leningrad and the northern Baltic Proper (north of Klaipeda & Gotland) was severely affected. The naval war machineries of the immediate combatants, Germany , the Soviet Union and Finland , plowed through the sea area for several months. The result was soon evident, see as example: St. Petersburg (Fig. B-11). Also numerous stations from Oslo , via Riga , Tallinn , and up to Moscow (no graph shown here) registered the 3rd winter as the coldest as well. For Kaliningrad the 1st winter was the coldest (Fig. B-10), as it was the case with Kaunas and Vilnius (not shown) and Berlin (Fig. B-12). In Minsk , only 300 km east of Kaliningrad , the 1st and the 3rd winters had very close values: 1/Q.1940 (-11, 5°C) and 1/Q.1942 (-11,0°C). These huge differences in a fairly narrow region represent a wonderful piece of evidence for the relevance of the naval war thesis. The listed time witnesses express their astonishment about the sudden arrival of the three war winters early in WWII and about their unique severity. There are others as well, but they are not so many; presumably not more than a dozen. Not one of them made even the slightest attempt to establish a link to war or to naval warfare. Even though this small group of trained meteorologists was made up of expert time witnesses, they failed to ask themselves even the simplest question. It is unbelievable! Regrettably, scientific ambition was not very well established in meteorology, at least not at that time. Great Britain was the main target of Nazi Germany during WWII. To fit the subject of the book to the thesis on naval war, one could imagine the Kingdom as a big battle ship in a rough sea. From a meteorological point of view, this battle ship was quite often closely involved in the battle between mild Atlantic air and cold continental air, which prevailed over Europe during the first three war winters. On the continent this situation generated arctic-like conditions. Many cold records could be registered. That was less pronounced on the “battle ship” Great Britain , but the Kingdom was not spared by freak weather, which may have had a lot to do with the war in general, and naval war in coastal waters around the island in particular. The most severe variations off average in successive years were those of 1939/40, 1940/41 and 1941/42. Quite astonishing! A nation which is said to be addicted to weather has never wondered whether the war weather conditions ran amok because of war activities around the island. The British meteorological service was completely ignorant to this fact. The ‘Met-Office’ prides itself as being one of the best weather services in the world. It is in possession of a wealth of data and information collected during WWII, but has done little, if anything, to analyze and explain many extraordinary weather conditions during the war. Actually, in their section History (http://www.metoffice.gov.uk/about-us/who/our-history), for the whole war period, they only mention that: “Forecasters advised General Eisenhower of a 36-hour 'weather window' for the D-Day landings.” That is all. Not a word that the D-Day forecast was mainly done by US experts, and, of course, nothing about their failure to predict a very severe three-day summer storm in the English Channel, that wrecked about 800 ships and floating units only two weeks after D-Day. · At that time, a very informative paper concerning the first three war winters had already been published by A. J. Drummond. It is a paper that proves to be helpful even today. Sir George Simpson welcomed it (A2a, page 3). · The present century has been marked by such a widespread tendency towards mild winters that the ‘old-fashioned winters’, of which one had heard so much, seemed to have gone for ever. 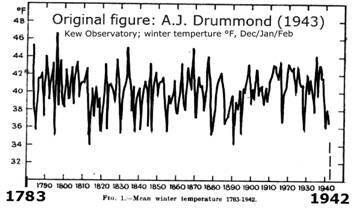 Drummonds addresses three interesting subjects, namely, temperature, wind and snow, relative to the Kew Observatory in Richmond , Surrey , now within Greater London. His data, observations and considerations are sufficient enough to present the unique winter situation during the three war years in a wider region. 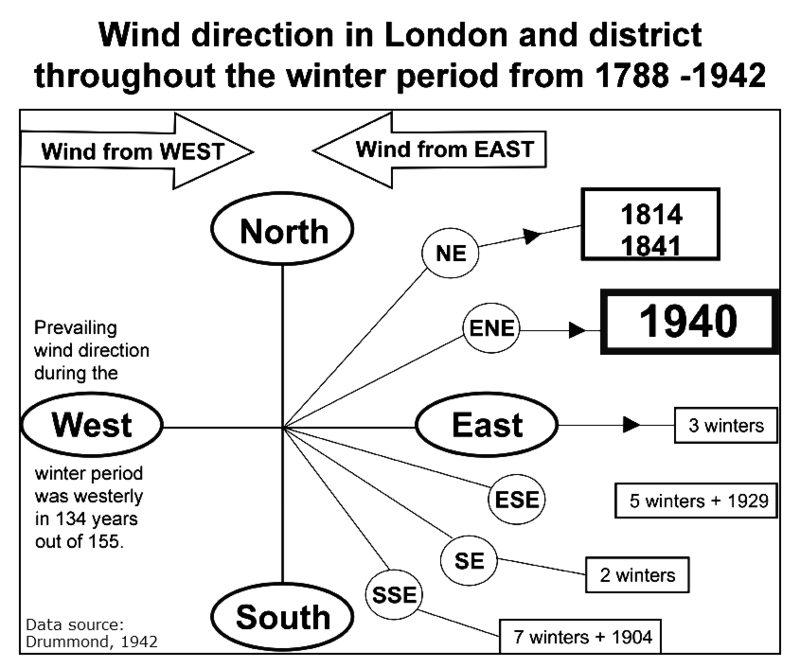 One of his time companions made it clear that the whole Kingdom had been under meteorological siege: “Three such severe winters in succession as 1940, 1941 and 1942 appear to be without precedent in the British Isles for at least 60 years, a similar succession occurring from 1879-1881.” (Lewis, 1943). At the end of his summary, Drummond refers to the war winters with the sentence: “The last three of these winters, 1939-40, 1940-41 and 1941-42 have been dealt with in considerable detail”. This may indicate that initially, the paper was to cover the cold winters only over a time period of about 250 years, but the sudden arrival of the three extreme war winters required special attention. These details are of interest here; if not mentioned otherwise, it means that they are from Drummond’s paper. Reference is made to the percentage number of “ice days” (days with max. 32°F = 0°C), and “frost days” (days with min. 32°F or less). Except for 1929 and the three war years, all the other years with a mean value between 29,4°F and 35, 5°F, in a total of 23 winter months (D/J/F), occurred before the year 1896. The listed years cover ice-days from max. 43% (Feb. 1895) and 3% (Jan. 1929). The listed years cover frost-days from max. 89% (Feb. 1942) and 52% (Jan. 1941). Regarding the average temperature for the period of 1940-42, January 1940 was the coldest month (31.7°F), while the second coldest was February 1942 (32.9°F). 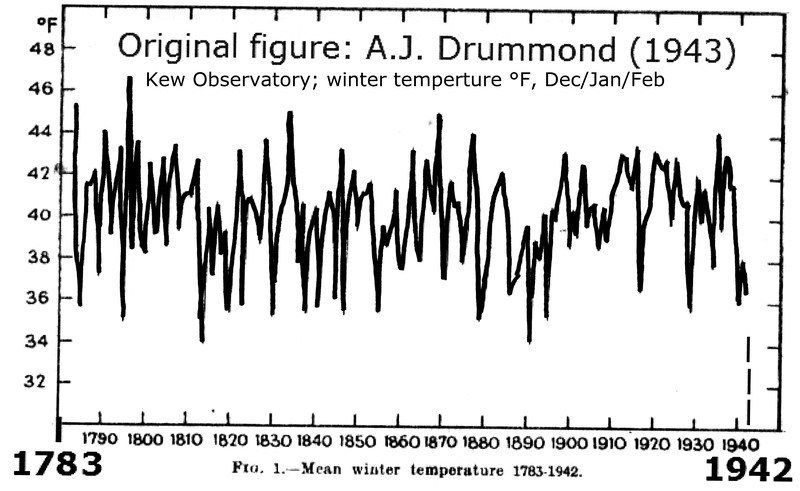 Regarding the temperature issue, Drummond mentions also that, since records on ‘mornings with ground frost’ began in 1904, there has been no January to equal that of 1940 or 1942, when frost was registered on 84 and 74 per cent of the respective days. The total number of frost periods during January and February 1942 (80%) is the highest on record for any two successive months, while that for December 1941 to February 1942 (68%) constitutes the highest for the winter period. Fig. C5-8 and C5-9 (page 73). “Since comparable records began in 1871, the only other three successive winters as snowy as the recent ones were those during the last war, namely 1915/16, 1916/17 and 1917/18, when snow fell on 23%, 48% and 23% of the days, respectively”. The “battle ship“ Great Britain receives an excessive snow cover during three consecutive winters, in comparable severe conditions, during the two World Wars of the last century, and no one in the department of climatology is interested in or capable of investigating and linking the two events to the war, in general and the naval war in particular. What a funny science. · “The three consecutive winters of 1940, 1941 and 1942 were, however, unusually severe; the snow was considerable and the number of days of snow-laying comparatively large”. Lewis mentions that his investigation is based on approximately 300 stations in Great Britain alone. January, 1940: Of all the six months, January 1940 had the lowest mean temperatures in Britain . The mean temperature at sea level was 33.0°F over Scotland , 31.7°F over England and Wales and below 30°F over large areas of central England and a smaller inland area in east Scotland . The duration of snow-cover, however, was not as great as in January 1941. February, 1940: the mean temperature for this month was considerably higher than in January 1940. A very cold spell with frequent snow showers occurred from the 9th-19th and snow lays continuously in some places until the 20th. January, 1941: Mean temperatures at sea level were very low. Snow fell frequently throughout the month, the snowfall of the third week being considerable, and strong winds caused deep drifts. Snow level was 12 inches (~30cm) deep at Hoylake and Prestwood on the 20th, at Lake Vyrnwy on the 21st, and 20 inches deep (~50cm) at Balmoral (central Scotland) on the 22nd: parts of Sutherland and Caithness (north Scotland) were isolated for several days. 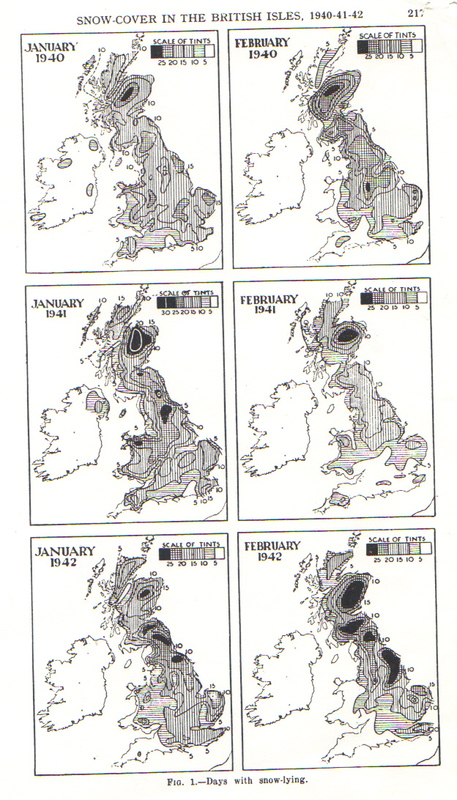 February, 1941: The lowest mean temperatures were in Scotland and northern England . The snowfall on the 18th-20th was abnormal, particularly in north-east England and south-east Scotland . There were more than 15 days of snow-cover over a large part of northern England and south and east Scotland , and around Braemar and Balmoral (~80km west of Aberdeen ) there was snow continuously throughout the month. 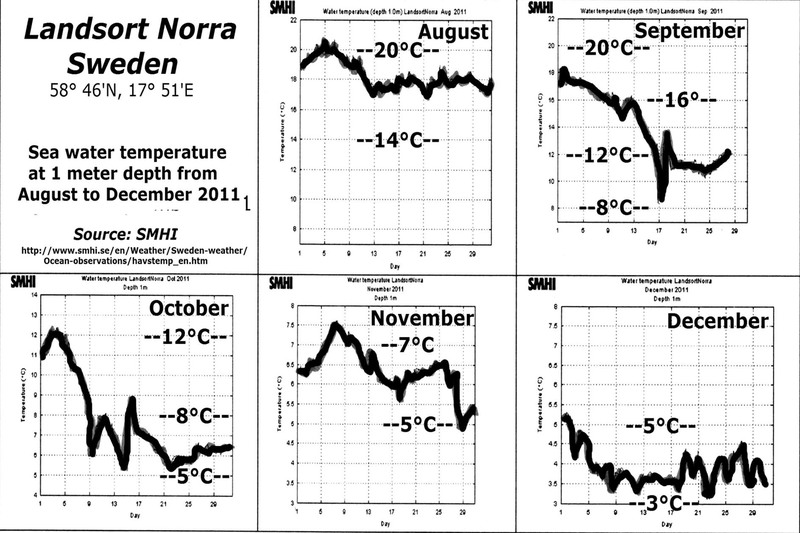 At these stations the mean temperature at station level was lower than 32°F (0°C). January, 1942: On the whole, the mean temperature was considerably higher than in the two previous months of Januaries. 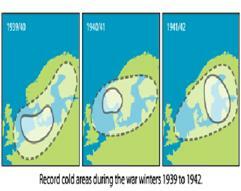 Compared to January 1941, the areas of the longest duration of snow-cover in England were shifted eastward. These areas extended from East Anglia to the Southern highlands of Scotland and over the inner parts of Aberdeenshire. Snow fell frequently and the snow storms on the 19th-21st were widespread and severe. In the north of Scotland it was said to have been the worst storm in many years and heavy drifting interfered seriously with road and rail traffic. February 1942: The very low temperature values were due to persistent cold rather than to any short period of intense cold. It has already been mentioned above that in February 1942 snow-laying was reported on each day of the month over large areas in the east and north-east of Britain . In contrast, in the same areas, in February 1943, the majority of stations reported no single day of snow-laying, the largest number of such days being six at both Breamar and Balmoral. That is an anormous amount of information. Any competent professional should be able to draw a number of conclusions about where and why the snow conditions occurred in this unusual manner while naval war romped around the British Isles . It is surprising that Drummond and Lewis are two of the few who addressed the meteorological conditions over Great Britain immediately after the three extreme war winters. The war subject was never taken into consideration neither by them, nor by their colleagues. The papers provide enough information, sufficient as to be a spur for generations of scientists to raise more questions, and to look for answers. But nothing, virtually nothing, has happened during the 70 years that have passed since then. The people on the imaginative “battle ship” Great Britain still do not know that many weather deviations and extremes during the war were caused by naval activities in the sea around them, and the MetOff never realized that “The sea makes the climate”. During the initial three years of WWII, the Baltic was not only stirred, but also shaken as it had never been before, or ever since. 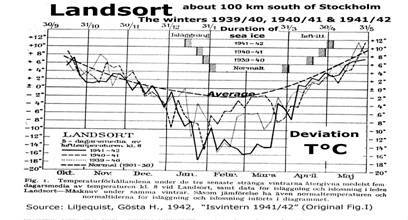 In close agreement with the intensity of the naval warfare activities in the North Sea and Baltic, the severity of ice cover and duration were present in each of the winters of 1939/40 (very heavy = 100%), 1940/41(unusually heavy = 80%), and 1941/42 (very extraordinarily heavy = 100%). But the most stunning aspect was that they emerged in a successive row, unprecedented during the time records that had been made, if not for the last 500 years. 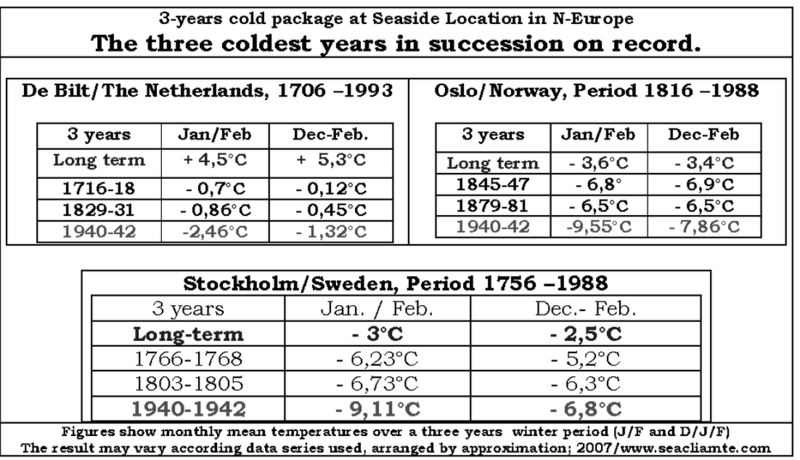 The 3-year package phenomenon is the subject of this section, each of the three ice winters being dealt with later in greater detail. The basics of the Baltic weather relevance will be briefly outlined and will be followed by the presentation of the extraordinary observations concerning the three sea ice years in succession. This leads to only one conclusion: naval warfare made a considerable contribution to this phenomenon. Those who now expect an academic discourse on the physical impact a naval war may have on the development of sea ice should take note that this would require a work of several hundred pages and would still not be regarded as enough comprehensive and detailed. Actually, I would call myself foolish if I did the job that science has not done since propeller driven vessels navigated the sea. Science should have picked up the issue after the weather had run amok during WWII and global cooling commenced simultaneously. Here it is enough and sufficient to apply very practical observations that have a considerable physical effect and are well known to everybody. Stir the hot soup or coffee: That will cool the liquid quicker than doing nothing. 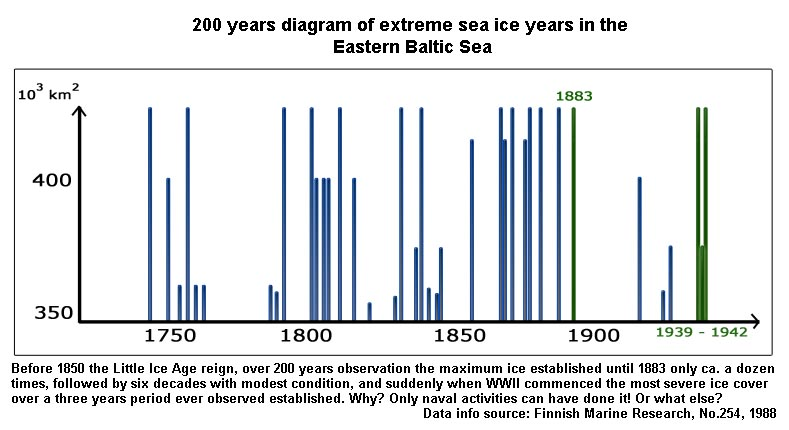 For science, the starting point on the extreme sea ice conditions in Northern Europe , during the initial war winter is very simple: they confirm the naval war thesis or explain other causes that may have generated the extraordinary sea ice conditions. Ignoring the issue any further or making claims without evidence, e.g. “natural variability”, are proof of objectively gross incompetence. The sea ice matter between England and Finland is primarily a Baltic issue. The seasonal ice cover can be a fraction of the whole size of the sea, usually 1/3 to ½, and rarely 100%. During the last 128 years it happened only three times: in 1939/40, in 1941/42 and in 1946/47. Is that not weird? The sea ice in the North Sea followed the same timing, but it is due to the small extent and special characteristics of the sea region in the North Sea and is not further investigated. In the following, there will be some explanation for the Baltic, which is in many respects very special. There is particularly the difference in salinity which has a great influence not only on density, but on the freezing point of water as well. 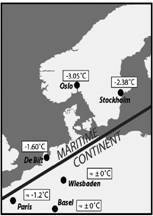 In the Bay of Bothnia , sea water freezes at about minus 0.2°C, and in the more saline Baltic Proper at about minus 0.5°C. 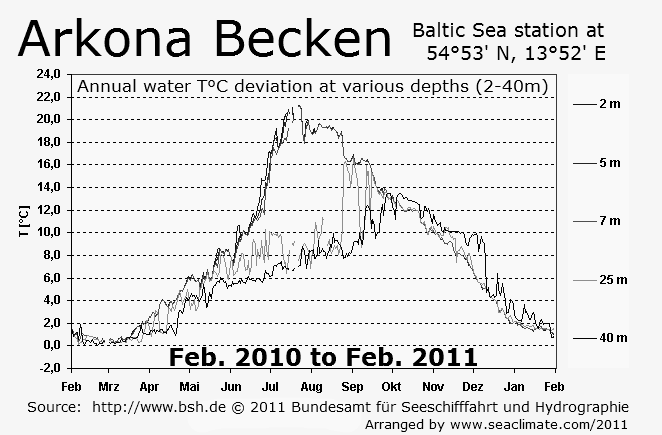 The maximum density of freshwater is at 4°C, while that of the brackish Baltic water is at 2.3° to 3.5°C. 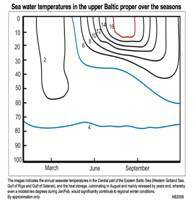 The other big issue is the warming and cooling of the sea water over the seasons. The colder and more saline the water, the heavier it is due to higher density. The heavier the water, the more it tends to sink. Warm and low saline water decreases the density and stays at the surface, until it is transported to deeper layers by the force of wind-waves, wind-current, and by a force that has not reached science, that of propeller driven vessels and naval warfare activities. The latter force is our concern. It is particularly effective during the autumn and the winter season, as it increases the release of heat stored in the sea. Thus, it can strongly influence the timing when freezing commences, and thereby, the intensity and duration of the sea ice season. o wind and wind generated waves. But from the industrial revolution, the wind got a companion to penetrate into the sea surface layer: propeller driven boats and vessels as they sail the seas in the hundreds of thousands. A considerable portion operates in the Baltic. They stir the surface layer down to considerable depth, either warm water downwards (summer) or warm water upwards (winter), as every one does when moving a spoon in a hot soup or a coffee cup. During the time of naval warfare activities, the stirring is more intense, comes with greater force, reaches lower sea layers and increases the mixing capacity by manifold. · by human activities, such as shipping, fishing and other uses that force mixing, such as: off shore wind farms in regions with tides and currents; e.g. 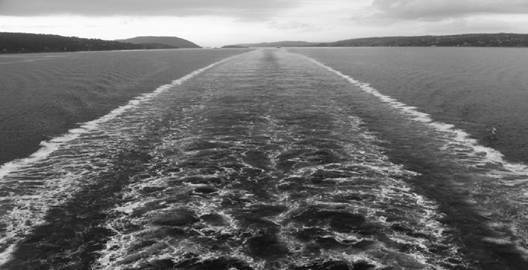 more in the North Sea,less in the Baltic Sea. 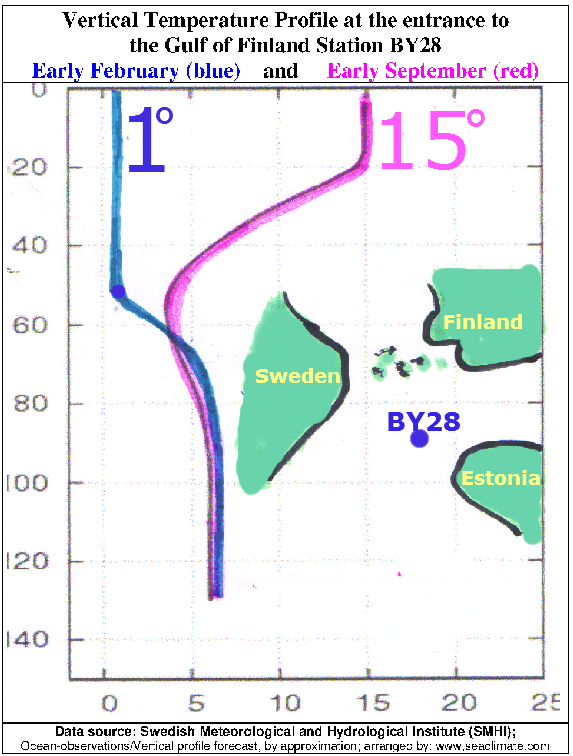 The factors rain and wind in the Baltic area are influenced by the fluctuation of atmospheric masses over the Atlantic Ocean, called the “ North Atlantic oscillation”. It is actually a question of maritime or continental dominance of the air, either humid or dry. The colder the sea surface of the Baltic gets, the more it acts continentally, completely ceasing to be a maritime factor, when fully covered by ice. Has the decade of the 1940s with four extreme ice winters, 1940, 1941, 1942, and 1947 ever been linked to the Second World War? No, at least not to my knowledge. Have the three ice years of the early 1940s been linked to the war? No, despite of the very obvious fact that this scenario was and is sensational in many respects. It seems that such a simple connection has never been considered, nor has an attempt been made to analyze the matter in this respect. These assessment changes would prevail if the post-war sea ice year 1947 is excluded. In the light of available data and published research, this scientific negligence is astonishing. 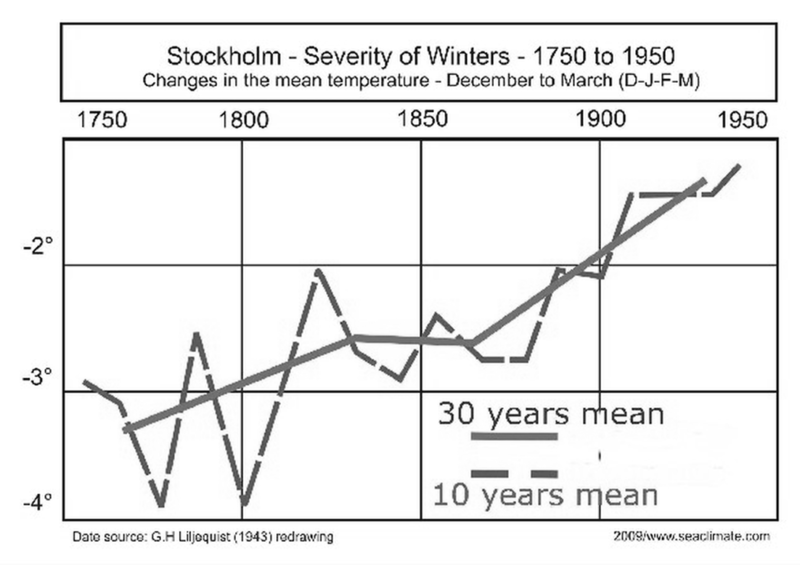 There is, for example, the excellent work of the Finnish Meteorological Institute, which offers the presumably best record on the severity of ice seasons since 1720. It is from this work that the Fig. B-16 is taken and has been redrawn (the upper image). During the 300 years of observation, from 1720 until 2002, the maximum ice extent (100%) had been reached only about 15 times, of which three belong to the mentioned 1940s decade, 1947 being the last year with a 100% ice cover. 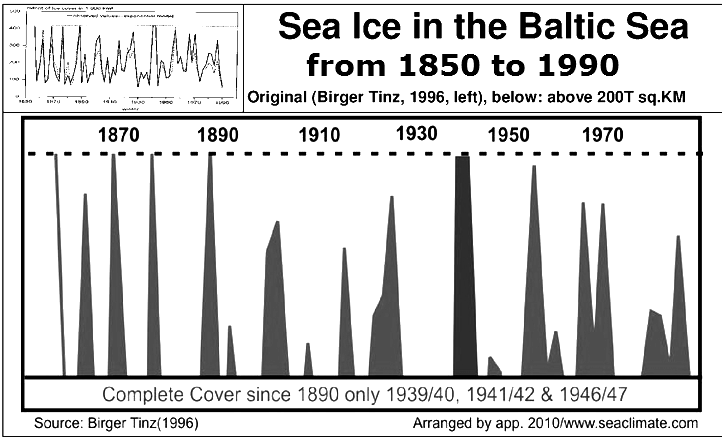 The previous year with a 100% ice cover was 1883 (see Fig. 16), which means that there had been a very low sea ice period for almost six decades. The long-term average is about 45% of its surface area at the annual maximum. After more than half a century, there appear not only one, but three heavy ice years in succession, two with a maximum, one with about 80% (1941). There is also the excellent work of Erkki Palosuo from 1953, which deals with severe ice conditions in general, but with the 1940s decade in particular. Palosuo (1912 – 2007) was a time witness and, as Squadron Deputy Lieutenant, he was given the task to perform ice reconnaissance flights over the Baltic. In 1947 he obtained the master degree in meteorology. Soon he was the leading sea ice expert, and presumably the best informed person, with the best access to data and information on the severe ice winters during WWII. Surprisingly enough, he never considered the role of naval warfare leading to this event. It is stunning, but meteorology did little to understand the role of the ocean then. Unfortunately, Erkki Palosuo was no exception, as many of his colleagues and successors in this field. in the war decade of WWII. 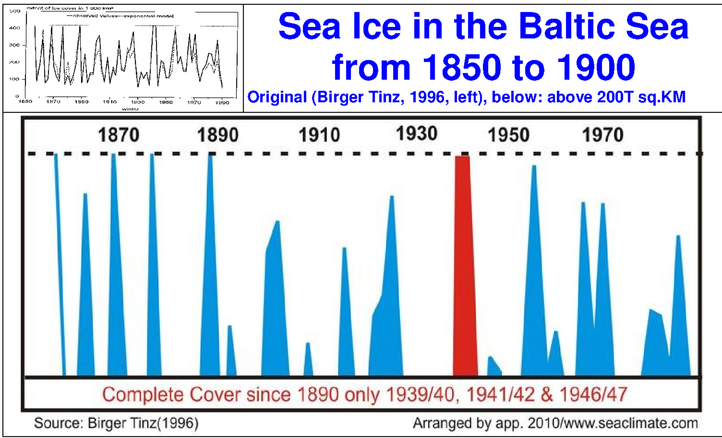 The significant difference is that the years with full ice cover before 1890 apparently stood alone, and were not in close succession as in the 1940s. 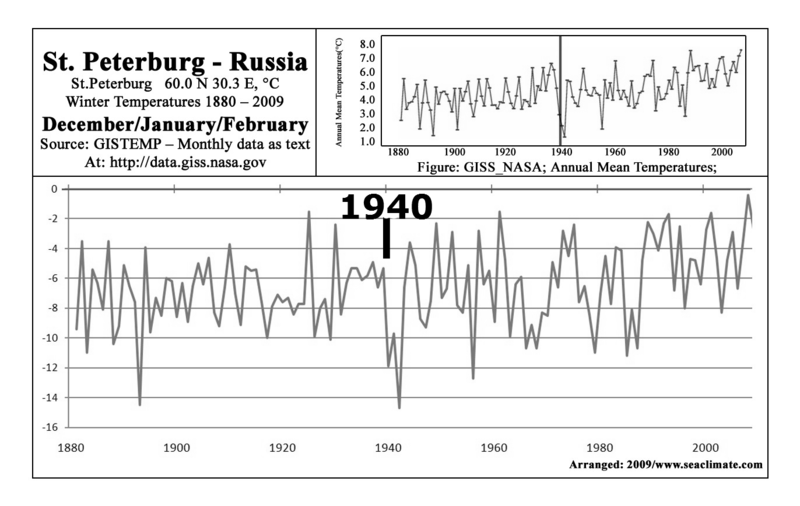 Simultaneously, the temperature situation in the early 1940s is extraordinary (Fig. B-16), making it difficult to understand why the scientific researcher did not raise the war issue. It would have been the most obvious question to ask: Why? 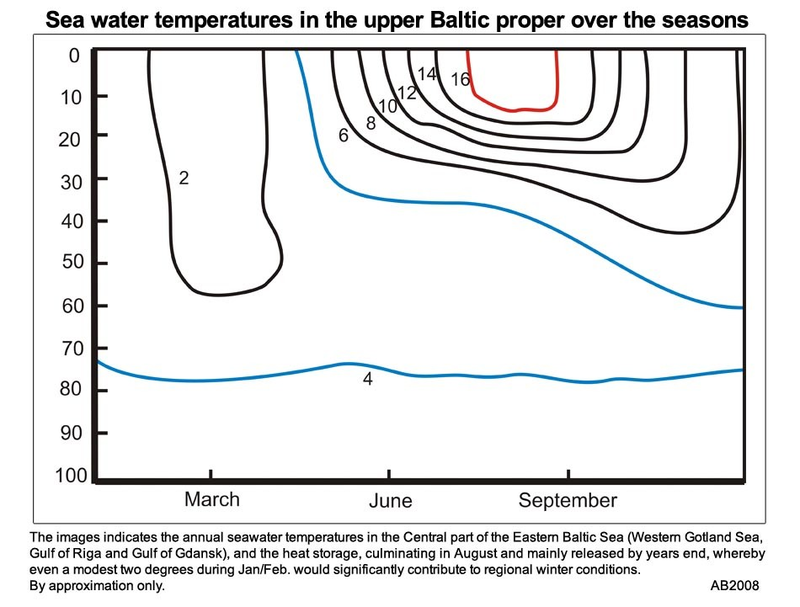 The ice conditions of the Baltic represented by the annual maximum extent of ice cover in the Baltic are closely related to the large atmospheric circulation. The areas of maximum correlation between the ice time series and the sea level pressure field coincide with the areas of maximum sea level pressure anomalies in extremely severe as well in extremely mild ice winters. Temperature anomalies in extreme ice winters concern large areas of Europe , while significant correlation coefficients between ice time series and air temperature fields can be found around the Baltic. 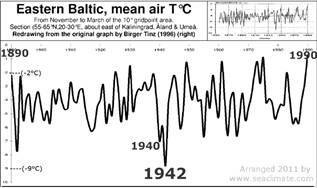 It is quite curious how Tinz correlates one statistic to another statistical series, not realising that such discussions ignore the search for the physical cause of the extraordinary ice cover and the temperature drop in the Baltic during the first three years of war. 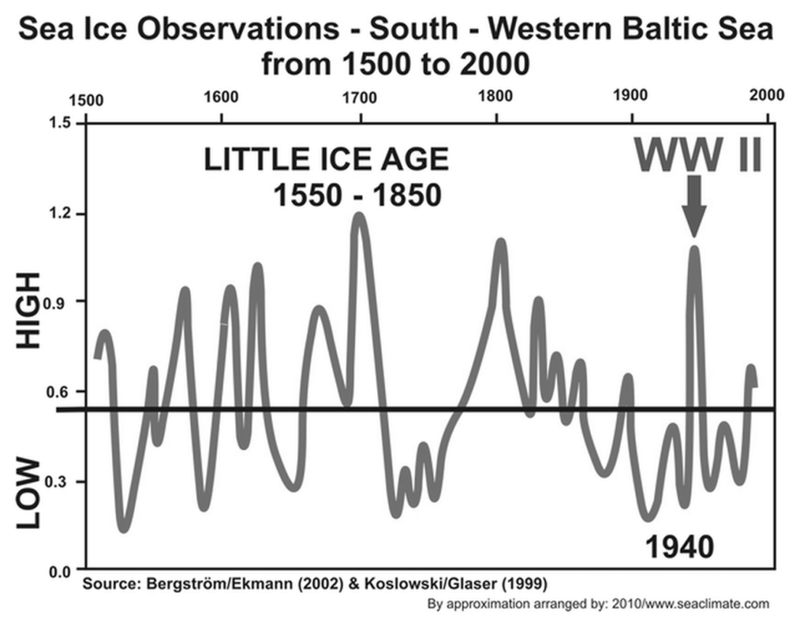 For the same reason, an ice-extent graphic in a paper by Koslowski et al. (1999) about the ‘Variations in reconstructed ice winter severity in the Western Baltic from 1501 to 1995, concerning the areal ice volume along the German Baltic coast’ is reproduced in a redrawing, Fig. B-19. · Variations in ice winter severity in the Western Baltic between 1501 and 1995 were investigated using an index time series derived from classified values of accumulated areal ice volume along the German Baltic coast, the time series back to 1701, having been extended to the beginning of the 16th century. · The calculated values of weak westerly flow expected per decade suggest that strong phases of increased ice winter severity were characterized by frequent blocking situations (weak westerly flow), and that, contrarily, the weak phases of reduced ice winter severity between about 1575 and 1860 may be regarded as phases of increased zonal circulation. (Koslowski, G. and Gläser, R. 1999). 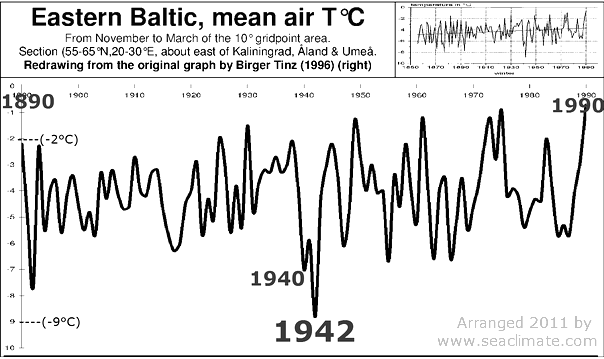 · Storch, Hans von (2002); „Reconstruction of Baltic data“, Baltex-text, 16/12/2002, p.5; via GKSS sever in PDF. http://coast.gkss.de/staff/storch/pdf/BALTEX.Lund.2002.pdf . · Girjatowicz, J.P. (2003); “Ice conditions in coastal lakes of the southern Baltic”, Ann. Limnol. - Int. J. Lim. Volume 39, Number 4. Ditto: (2005) Journal of Coastal Research: Volume 21, Issue 2: pp. 281 – 291. But, none of these authors had shown any capability to consider a link between the excessive icing early in WWII and the naval warfare activities. In summary: The sudden and presumably unprecedented occurrence of three, or, including 1947, four extreme ice winters in just one decade, leaves little room for not questioning the role of naval warfare as being a likely cause. We are talking about a time duration of about 200 years (Fig. 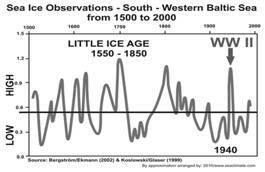 B-13) and the complete Little Ice Age of about 500 years (Fig. B-19), known for much colder years over longer periods of time, with not more than about 25 times highest ice cover in the Western Baltic since 1400.
. And suddenly, in the middle of the 20th century, there is an ice situation which easily matches the worst icing during previous centuries and there is no explanation for that? Impossible! It is incredible that scientists do not offer any explanation, simply because they do not even see that there is a question to answer. In the following chapters, each of the war winters 1940, 1941, and 1942 will be analyzed individually. This will include the sea ice development since December until the ice cover reached its maximum. This will prove to be another sufficient method to show that naval warfare activities contributed significantly. 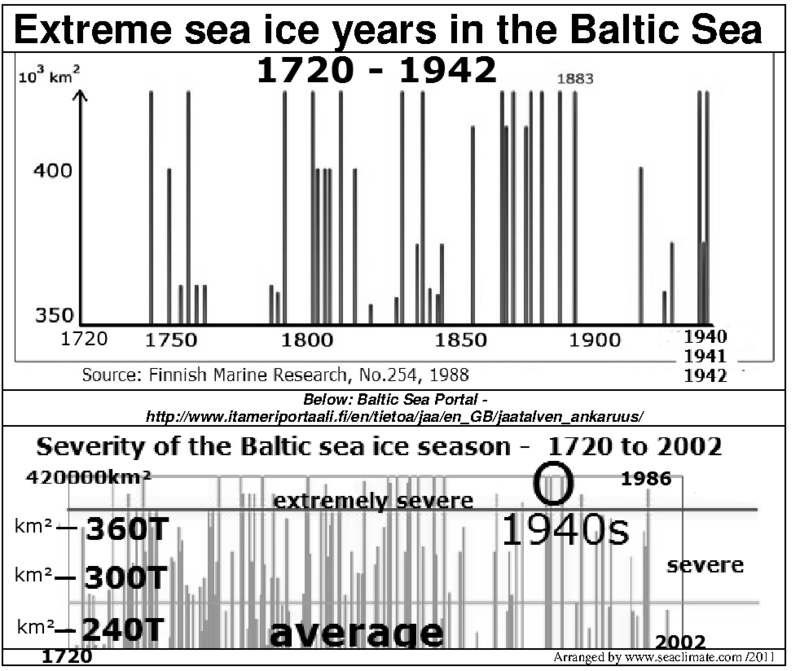 But already the three-year package analysis could result in the statement, that the special Baltic ice situation 70 years ago can tell a lot to an interested research community. g. A thriller about the cold – But science is ignorant. What are the changes that climatology needs to talk about? No doubt the anthropogenic increase of carbon dioxide is such a subject. Also, a volcanic eruption or a meteorite hitting the Earth would stir their interest. What about a major war, or even two major wars? Forget it, no chance. The world had two big wars, each of them coinciding with a climatic shift. Warming after WWI! Cooling after WWII! 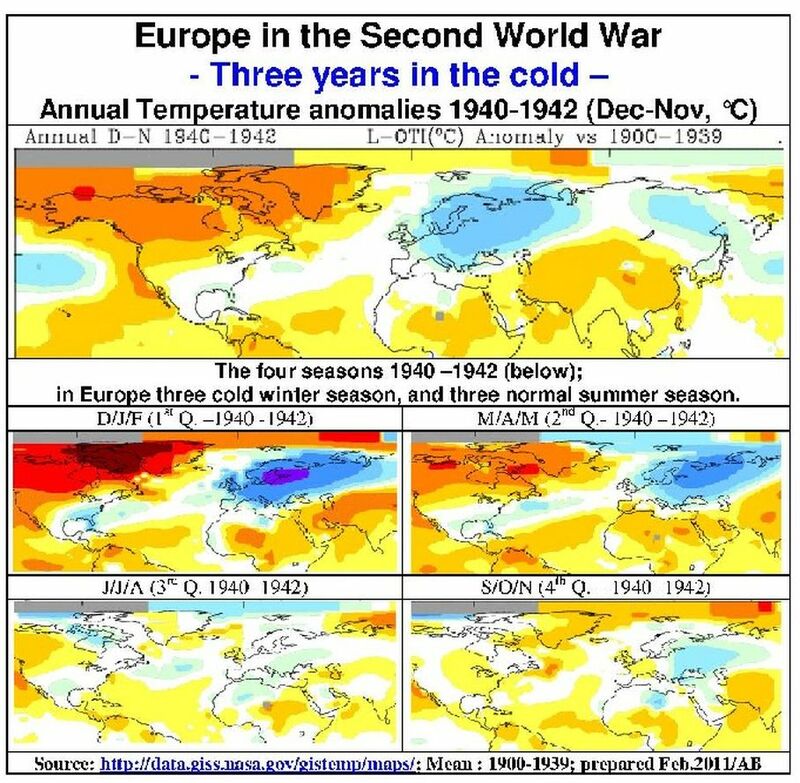 In addition, one war correlated with three amazing successive cold winters in Europe . 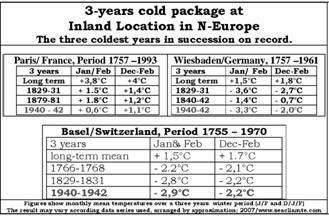 Each of these winters produced numerous freezing records, and adding these three winters together, they turned out to be among two or three of the coldest in Northern Europe during the last 2.000 years. However, science has shown no interest, but seems to act according to the motto: climatic change is only present where we want, or where we are able to see it. That needs to be changed and this section intends to demonstrate how severe and out of tune the three successive war winters of 1940, 1941, and 1942 had been; and by that I mean not little, but completely out of tune with long term historical mean values. Behind this is the sea, respectively are human activities in the sea, and it is regrettable that science seems to lack the insight that the oceans rule climate. One cold winter may not convince everyone that naval warfare is as destructive to climate as any major natural event. Therefore, the initial three war winters will be analysed as a ‘package’ and only in a later section each winter will be analysed individually. The concept of this presentation is closely related to the method used by the repeatedly mentioned Swedish meteorologist Gösta Liljequist (1943), who stressed that three successive extreme winters are a very rare exception. Liljequist observation has presumably something to do with the fact that the northern part of Europe is half continent, half water. Furthermore, the region is well served with warm and moist air by the west wind drift from the North Atlantic . The North Sea and the Baltic are warmed during the summer season until about the end of August. The bulk of heat is released from September until the end of the year. The station “Arkona Becken” (see Fig. B-20) may serve as an example. · The rougher the sea gets, the higher wind and waves are the more heat leaves the water column. · As soon as the sea surface is covered by ice, the heat transfer stops in both cases, not 100%, but to a very high percentage. · An early sea ice cover during the winter is the most likely mechanism that minimises the chance that the next winter will get cold as well. The sea body has contained more heat, thus the sea ice in previous years prevented further cooling. During the core of winter months a few tenths of one degree within the water column from top to bottom can make a big difference. Within this scenario one should not overlook the role anthropogenic ocean use may play. Not only wind exists as an external force to warm and cool the sea surface layer. Particularly forceful naval warfare can interfere with commonly pure natural processes. 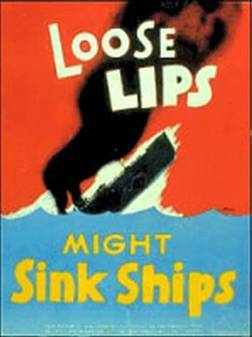 Whether sea surface water is warm or cold, naval navigation and warfare does not care. The upper sea level is churned and turned with no regard to the fact that the North Sea and Baltic can sustain moderate maritime winter conditions only when they are able to release heat according to standard or calculated statistical averages. This was grossly ignored during the first three war winters. It is possible to prove these facts, at least within the meaning of ‘prima facie evidence’. Actually, the war winter temperature statistics 1939-1942 are nothing less than a “Big Bang”. One needs only to analyze a few locations in Europe , by comparing “sea side” and “inland” locations. However, in order to better realise the dimension we are talking about, it is worth noting the few ups and downs of the temperatures in the Northern Hemisphere (30-90° North) over the last 2.000 years. During this long period of time the mean temperature has varied in the small range of +0.3°C and –0.8°C, with three peak periods [about 100AC (+0.3°C), 900AC (+0.3°C), and 2.000AC (+0.2°C)] and two low periods [about 500AC (-0.6°C), and 1.700AC (-0.8°C] (Ljungqvist, 2010). 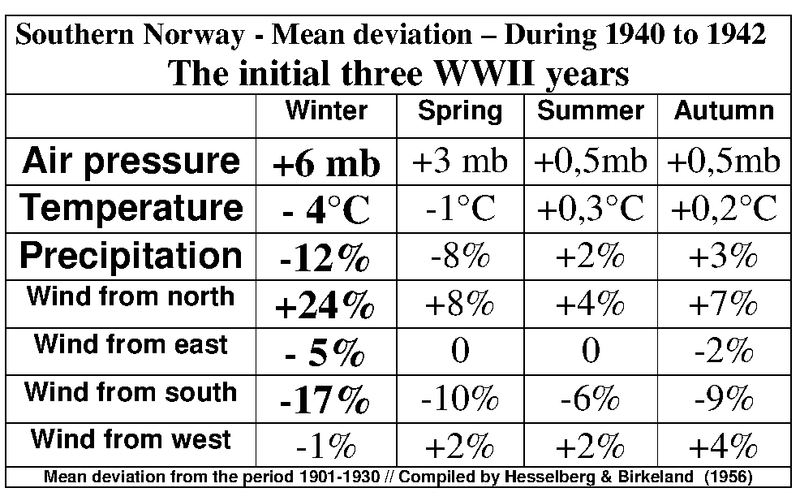 It is astonishing that the war winters of 1940, 1941 and 1942 did not only establish an all time record, but left the next coldest three-year package far behind. This happened particularly during the core winter months January and February. Each of these six winter months had been 1.6°C (De Bilt), 2.7°C ( Oslo ), and 2.4°C ( Stockholm ) colder than any previous cold record. It is worth noting that the difference between the 2nd and the 3rd rank is comparably very small (below 0.5°C). Furthermore, it is revealing that within this group of three maritime locations, Oslo (the closest to the Atlantic, at least by distance) is taking the lead, presumably due to the very cold sub-surface water of the Skagerrak with depths of up to 700 meters. It is also not a mere coincidence that the coldest January in the Oslo series is January 1941; only half a year earlier, in April 1940, Germany had occupied Norway accompanied by huge naval activities along the Norwegian coast. 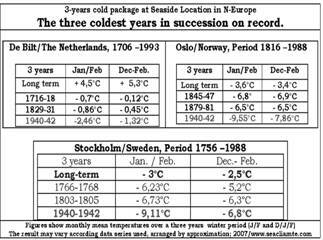 Neither is the fact that the three coldest January months in the Oslo pre-war data series of almost 200 years occurred during war time, viz. 1941 (-13°C), 1942 (-12.1°C) and 1917 (-11.6°C). 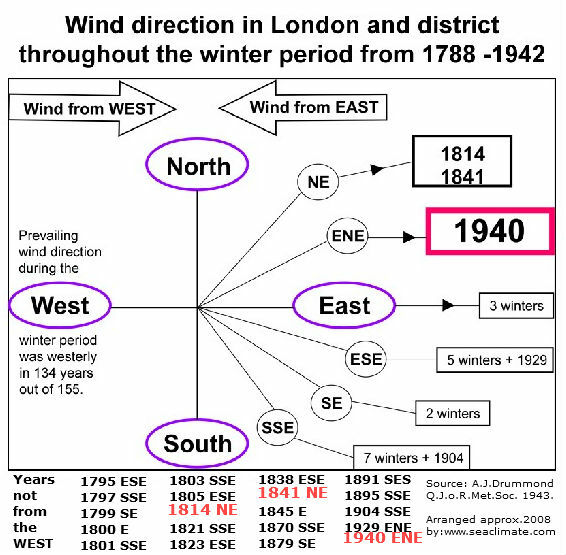 Greenwich 1841-1960; Sum Jan /Feb, 1940-42 (+ 8.7°C), 1879/81 (+12.8°C), and 1893/95 (+15.3°C). 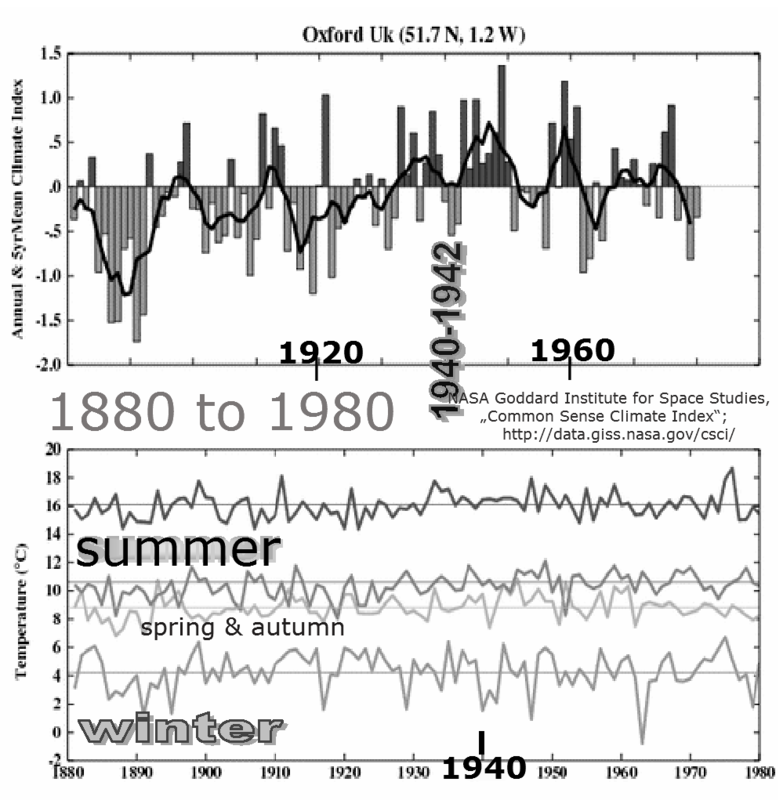 Oxford 1828-1980; Sum Jan/Feb, 1940-42 (+ 7.6°C), 1879/81 (+11.8°C), and 1829/31 (+12.2°C). Edinburgh 1764-1960; Sum Jan /Feb 1940-42 (+ 7.6°C), 1836/39 (+ 8.6°C), and 1774/76 (+ 10.4°C). All three inland locations demonstrate that the three war winters occupied the leading role in the data series of cold winters. This is the first point to reckon with. The more important aspect is that their pronounced position is dramatically outdone by the presented sea side locations, by 1.5° to 3°C. That is absolutely stunning. The large difference is evidently related to naval warfare activities. It is clearly related to the weak heat status of the North Sea and Baltic, as far westwards, beyond Scotland and the Orkney Islands, the air temperature remains significantly closer to the normal range (see: TM3, page 25). That is even demonstrated within the three given examples (Figure B-23/24). While Wiesbaden and Basel only show very marginal differences to previous cold records, Paris recorded a difference of 1.2°C for January/February, which puts it close to the sea-side cities. To regard all these facts as mere coincidence and natural variability is irresponsible. 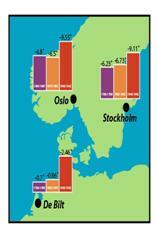 The North Sea and Baltic can contribute to winter air temperatures only depending on their available heat storage. If this has been reduced too early, the regional temperatures must get below statistical mean values and records will fall in large numbers. 1.000 naval vessels crossing sensitive seas in combat missions day and night are as good as a number of low pressure cyclones squeezing heat out of the sea. A cyclone is gone after one or two days, naval warfare was to stay since September 1st 1939, day and night, for weeks, for months and several years. The previous section highlighted the uniqueness of the three successive war winters of 1939/40, 1940/41, and 1941/42, mainly from regional data series. All data series from London to Moscow , and there are a lot of them, indicated exceptional temperature conditions during the winter season. By a few straight considerations, the stunning exceptionality of this winter package could have been demonstrated. This was recognised as early as 1942, for example by Liljequist ( Sweden ) and Drummond ( UK ). They already mentioned that three cold winters in succession are a rare fact. Everyone who is a bit familiar with the available data series could quickly recognise that a cold winter is one thing, but three in a row are difficult to detect. But neither of my two favourite authors Liljequist and Drummond, nor later generations, thought it worthwhile taking a deeper look into this matter. But before closing this section, to analyze each of the 3-package winters individually, and the two major climatic shifts, the contrast between Europe and the world shall briefly be mentioned. For this purpose, the material offered nowadays by the US National Aeronautics and Space Administration (http://data.giss.nasa.gov/gistemp/maps/) is highly appreciated. Offering in addition the means to prepare images by years, seasons, or months, is very helpful. That was done in temperature map, TM3 (p. 25), to indicate the solitary cold Europe in a warm world during the three first WWII winters. · On an annual basis one could say: during the three war years of 1940-42 the world was warm, only Europe was severely cold. · The winter season (1st & 2nd quarter) stands in considerable contrast to the summer season (3rd & 4th quarter). It may also serve as an indication that the war had an impact, respectively that the waters around Great Britain and the Baltic were too cold during the winter and remained too cold throughout the spring season (M/A/M/). Although a review of the 3-year winter package is a valuable piece of evidence for the naval warfare thesis, a detailed analysis of each war winter will come up with more interesting proof. Each winter has its specific finger print, which means that in the region with the highest naval activities during the pre-winter months, the drop of temperatures under statistical mean values was the highest, which will be shown in the following sections. 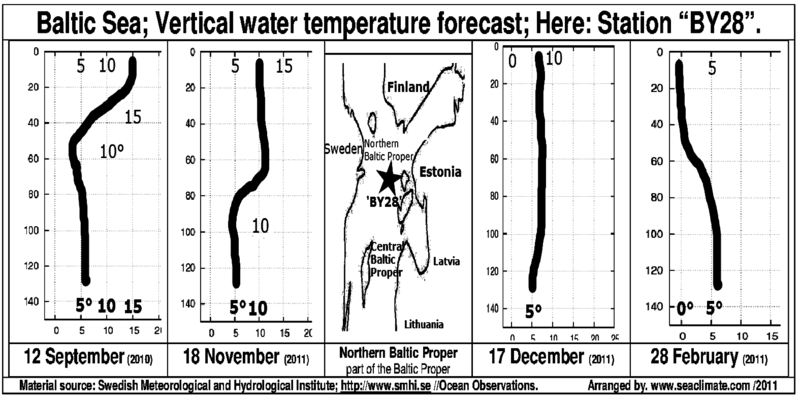 Figure B-25, Water temperature in the Baltic Sea (Landsort Norra) at one meter depth. The winters 1940/41/42 make the difference.